In a food processor, pulse the 2 1/2 cups of flour with the salt. Add the butter and pulse until it is the size of small peas. Add the egg yolk and ice water and pulse until the pastry is moistened. Turn the pastry out onto a floured work surface and knead 2 or 3 times, just until smooth. Pat the pastry into 2 disks, wrap in plastic and refrigerate until firm, about 20 minutes. In a large skillet, cook the bacon over moderately high heat, stirring, until browned and crisp, about 7 minutes. Drain the bacon, leaving 1 tablespoon of the fat in the pan. Add the leeks and thyme to the skillet, season with salt and white pepper and cook over moderate heat, stirring occasionally, until the leeks are softened but not browned, about 5 minutes. Transfer to a bowl and let cool. Stir in the bacon and cheese. The quiches can be covered and refrigerated overnight. Reheat the quiches gently before serving. 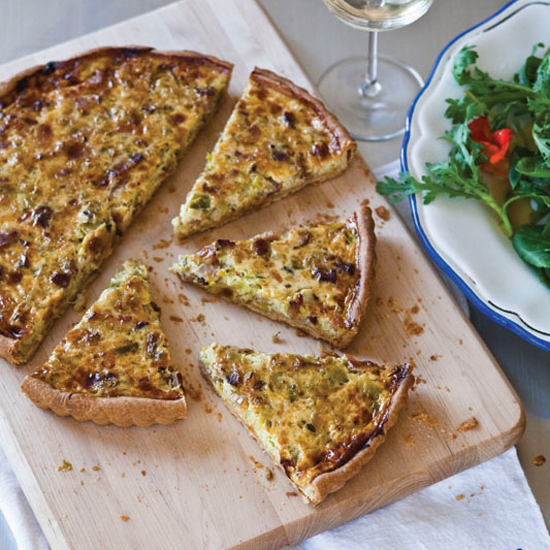 Winemakers in Bordeaux often blend Sémillon and Sauvignon Blanc to produce lightly honeyed, citrusy whites that go very well with rich quiches like the bacon-and-leek one here.